Union security clauses that determine union dues and mandatory membership have become a contentious issue in the United States, especially recently. Depending on state legislation, unions have potential to negotiate either a union or an agency shop security clause in their respective collective bargaining agreement. Under a union shop, individuals are required to join the union and pay dues as a requirement for working in a unionized workplace. An agency shop does not require membership but does require payment of union dues after having been employed because the non-member still benefits from the bargaining agreement. Technically, all unionized workplaces with security clauses in place can only legally be agency shops due to a 1963 U.S. Supreme Court ruling that union shop clauses can only be enforced as agency shops (NLRB v. General Motors, 373 U.S. 734). And, dues that employees would have to pay if they determined not to join the union are reduced if they exercise their U.S. Supreme Court sanctioned Beck rights (Communication Workers of America v. Beck, 487 U.S. 735 ) – only financially contributing to the union the proportion of union dues that covers representation associated to collective bargaining and contract administration. It would seem that the above U.S. Supreme Court decisions (though somewhat harmful to union power) would be enough to provide those employees in unionized environments an “out” if they preferred not to join the union yet would still hold them somewhat accountable by having them contribute to the union – especially given they still benefit from the union contract but are not members in a unionized workplace. Well, this is questionable. Previous to these U.S. Supreme Court decisions, the Congress passed the Taft-Hartley Act in 1947 which allows U.S. State legislatures to pass laws that ban the inclusion of security clauses in collective bargaining agreements. Thus, over the past 60 years or so, states particularly in the South, Rockies, and Great Plains have passed Right to Work (RTW) laws that prohibit unionized workplaces to require employees to join and pay dues to the union – fostering an influx of non-members in unionized workplaces. It is important to note that non-members in unionized environments are covered and protected by the collective bargaining agreement in their respective workplace. Politicians and proponents (typically Republicans) who support RTW legislation have used and continue to use language such as “forced unionization” to emphasize their perspective that, without RTW laws in place, employees, in their opinion, lack “free choice” and “liberty” in the workplace and that RTW laws are “pro-job” and “pro-worker.” However, this language appears to be a guise to conceal true political motivation instead of narrowing the inequality gap for middle-class workers. Additionally, proponents tend to be quoted in popular press or appear in media clips suggesting that RTW states are more attractive to business – leading to economic growth, more private sector jobs, and increasing incomes. Yet, the evidence used to support these claims has been anecdotal and spurious at best. The academic literature is limited in its evidence to support these assertions, and more scholarly investigation is required. Though political sound bites suggest freedom and choice for workers, Gov. Walker appears to be using the RTW legislation as fuel to propel his political aspirations. Republicans have always had to battle union power and the union’s ability to get their members to the polls. With a weakened union, this can change the political landscape and make it potentially easier for Republicans to be elected especially in areas like the Midwest where unions have been traditionally strong. Gov. Walker is running for the 2016 Republican Presidential nomination and, given his success in limiting union power in Wisconsin, is becoming the darling of the Republican Party. Since Gov. 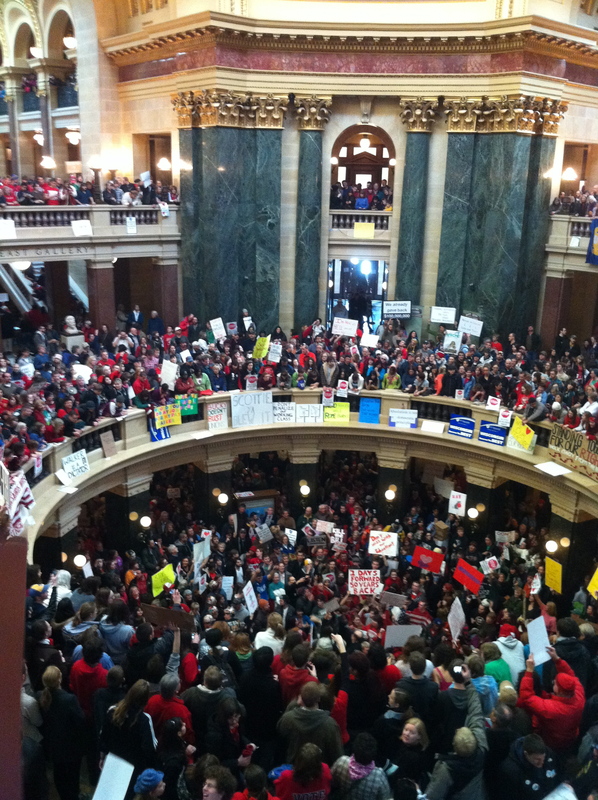 Walker took office in 2010, union membership has dropped by 2.5 percentage points to 11.7 percent in the state. Hence, RTW laws are not necessarily pro-worker. In fact, the legislation seems to function as a tool to weaken a political opponent. And, opponents to this legislation would also argue it is actually anti-worker. As President Obama has suggested in this debate, perhaps politicians should be more focused on aiding American workers in providing them a living wage and providing security such as paid time off instead of undermining an institution designed to promote better working conditions, employee well-being, voice and better pay. Hopefully, the electorate in states who are currently debating RTW laws, such as Illinois, Kentucky, Missouri, New Mexico, and Oregon, will not just take for granted language used by proponents to justify RTW, such as worker choice and liberty, and will further investigate for themselves whether it is merely window dressing or not. If the premises are accurate that RTW law is a vehicle for weakening union strength and not good for workers, the murmurs of future RTW law passage or governors implementing executive orders allowing state workers to forego paying union fees (e.g., Illinois) or local municipalities and counties interpreting Section 14(b) of the National Labor Relation Act as giving them the right to enact RTW law locally (e.g., Kentucky) could have grave implications for workers generally. In essence, workers must question and assess whether RTW laws are actually promoting worker rights and stability or simply stripping rights and security away. If unions are weakened or perhaps not in place at all, how will workers achieve gains required to sustain themselves and their families especially with weakened or no voice and representation? We must seriously consider and investigate whether RTW is destabilizing the middle-class – and only perpetuating the widening gap between the haves and the have nots. Or, are there actually benefits from RTW for workers? Given our limited evidence, currently, RTW comes across as a political guise with limited (if any) evidence of helping workers. However, one might wonder: if RTW prevails and more states adopt the worker choice mentality, how might unions maintain their numbers and curtail the demise to their strength? A radical thought could be that unions also embrace “choice” and forego mandatory dues or membership provisions. This would require union leaders to be heavily engaged with the rank and file on a rather frequent basis, building and nurturing relationships and educating and illustrating employees of the benefits of unions in a tangible way – so that employees are constantly cognizant of the good unions bring and will voluntarily choose to be members and pay dues. This could lead to sustained patterns of membership. And, if we determine that RTW law in actuality is solely a tool to weaken the political opponent, then RTW will backfire in the faces of its proponents if unions are able to prevail and sustain their numbers by also embracing choice. Jonathan Booth is an Assistant Professor in Organisational Behaviour and Human Resource Management at the LSE’s Department of Management. Cross-posted at USApp– American Politics and Policy.